Ed and Helen Sick with the new sign that Ed made. Great job Ed!! 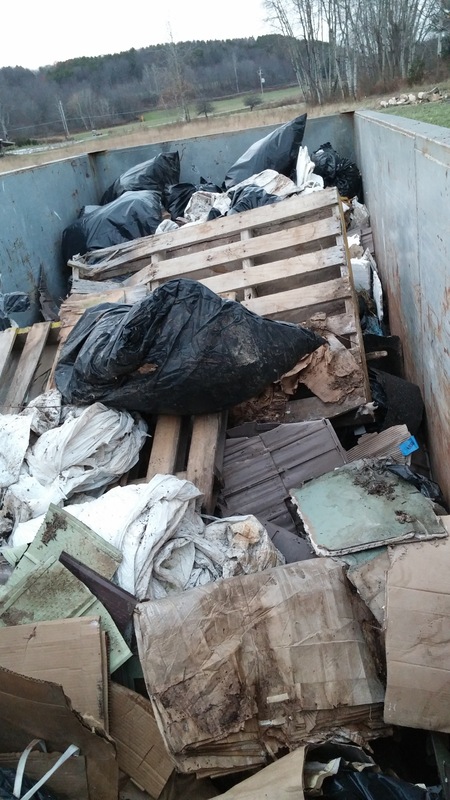 Volunteer workers filled half of this dumpster with trash. 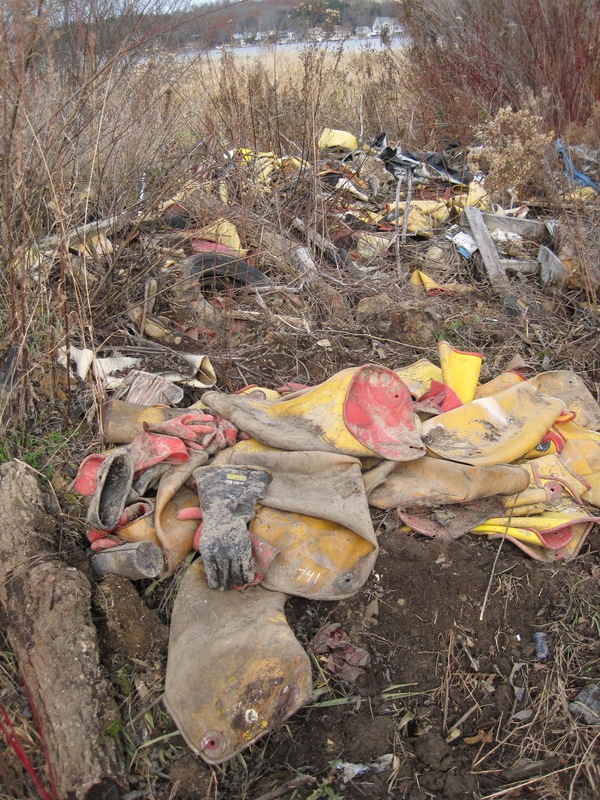 Steuben County workers, using heavy equipment then filled 23 additional truckloads with more trash!!! The trucking was provided by the Town of Wayland. 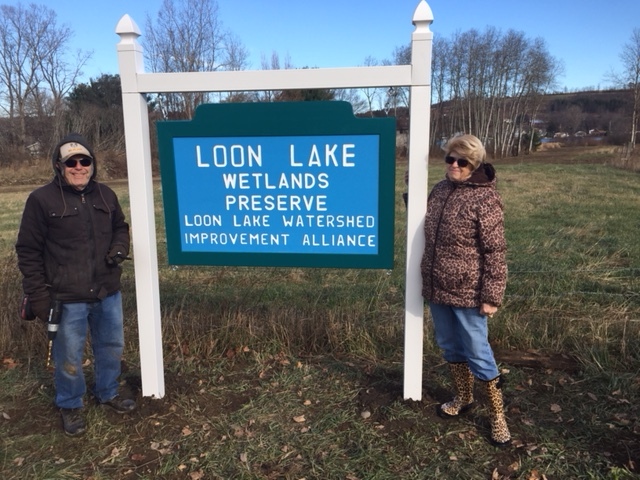 Eric Busch (LLWIA Property Manager) and Helen Sick (LLWIA Board) on site. Note the heavy bulldozer in the backround. 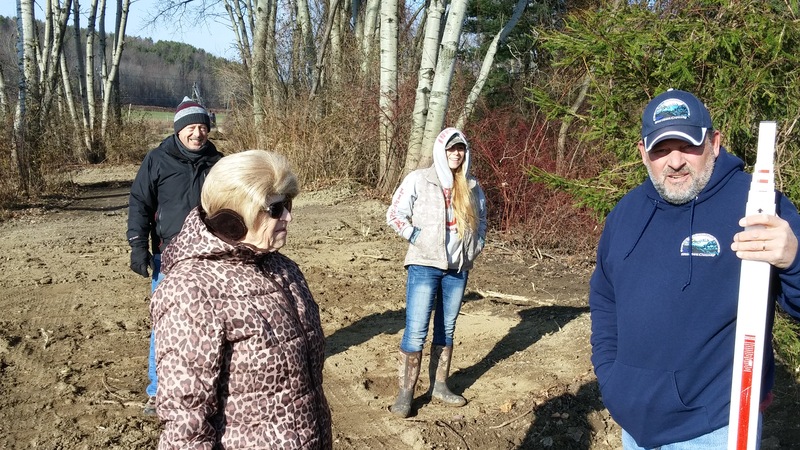 Steuben County Soil and Water (SWCD) Jeff Parker (right), and his intern Chelsea Bartlett (middle), Busch and Sick (left) on Wednesday 11/15/17 at the site. Photo shows the clean out of the creek and the bull dozing to allow any overflow to flow onto the property. This work should solve the problem of flooding on Davis Road for the foreseeable future. 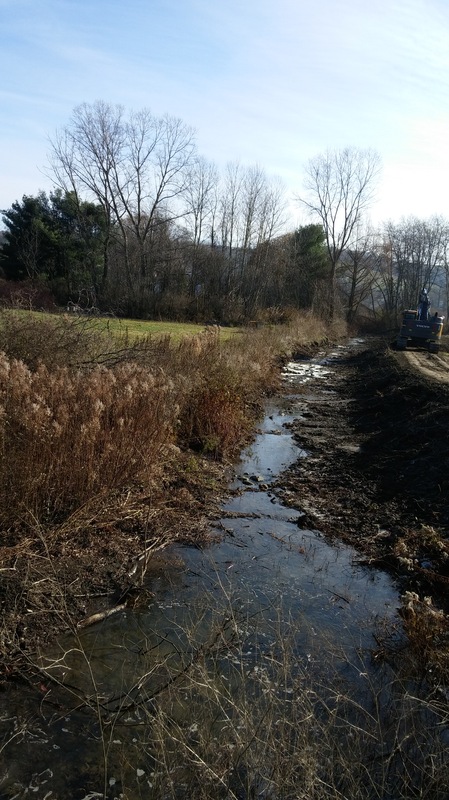 Many thanks to Steuben County Soil and water and the Town of Wayland for this great work to clean out the creek and remove trash from the property. 1. A big day. They finished Phase One at the Wetlands Preserve this morning, just as rain, sleet, and snow hit the area. All folks from both public entities did wonderful work- we will thank them in writing shortly. It was too dark and nasty to take pictures today, will try to get some tomorrow. 2. Within two hours of the finish of grading Steuben workers were putting down grass seed mixed with clover and other plants on all exposed ground per previous plans. Not their first rodeo. They will lend to us next week a machine to chop and blow straw mulch over that seed and ground. Most seed will likely not germinate until warmer spring temperatures and the seed is chosen with that plan in mind. The flood plain has a slope of only 6 inches per hundred feet in order to insure that flood waters will slow and drop the maximum amount of sediment possible. It is thought that with this slow water flow the mulch and seed will likely hold. 3. We calculated the cost of the project just completed for us for free from Steuben and Wayland at $40,000 to $50,000. That includes such costs as the excavator and operator at $450 per hour. 4. 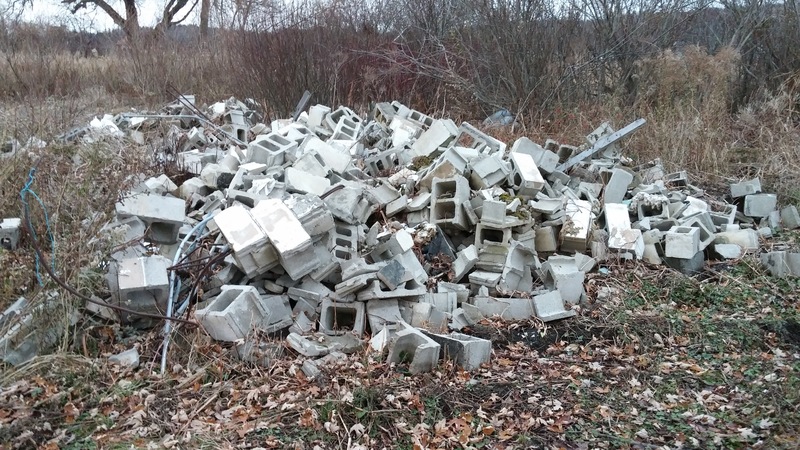 Turns out I was wrong about the estimated 12 truckloads of debris and fill removed from the wetlands proper- it was really 23 truckloads per the operator’s notes. 5. 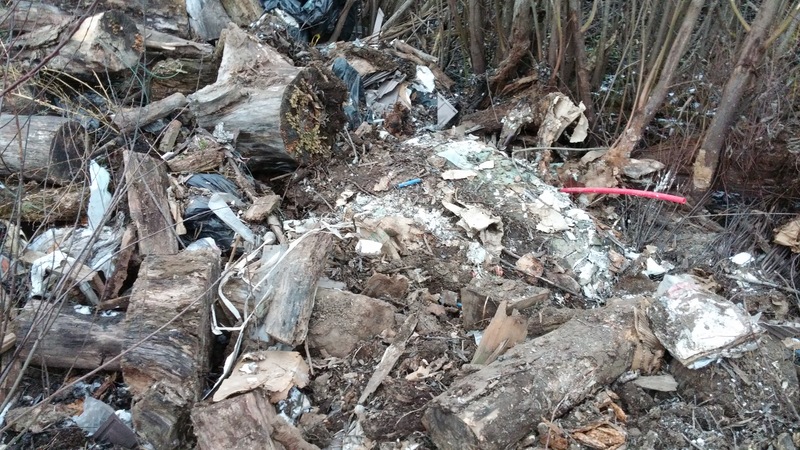 They also removed the remaining dock supports made of guardrail using the excavator and set them on shore. Another bonus. 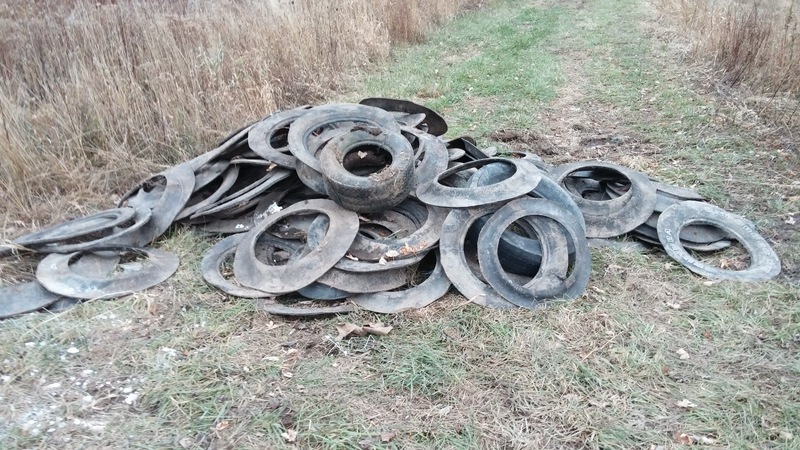 Our scrap hauler is to remove them, the old tank, and the two barrels of barbed wire in the next few days. No spring boat hazards! 6. 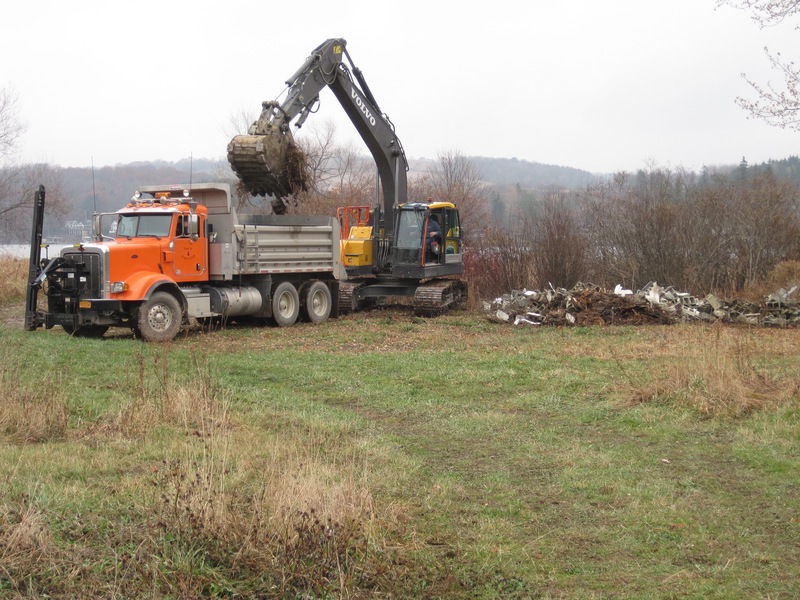 We were also able to stockpile topsoil for fill and other projects near the previously existing dirt pile. They also filled and graded the corner of the driveway off Chapel Road and seeded that area. Another bonus. 7. 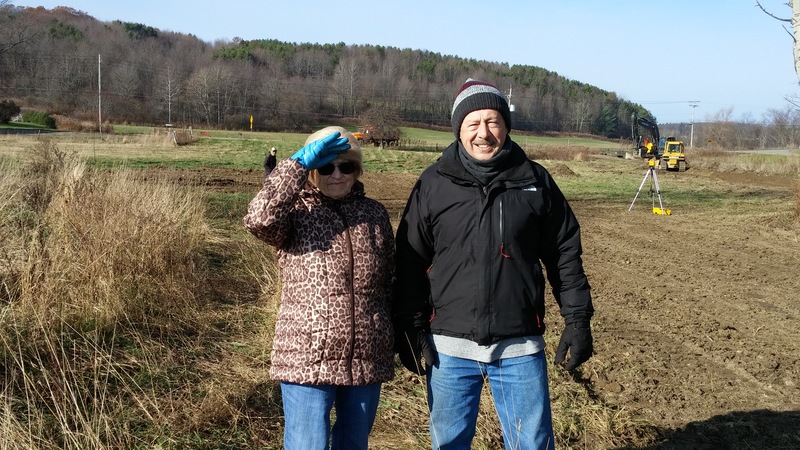 Alice and her Environmental group with assistance from various plant specialists will be formulating a plan for creek bank trees, bushes, and other plants to be installed as early as possible next year. That will be discussed with both the operating group and directors before installation. 8. Last but not least, Ed Sick has finished the sign supports and we plan to install that fantastic sign tomorrow morning. Pictures to follow.